As a Specialist Arts College, Leading Edge School and School of Creativity, we have sought to create a variety of learning experiences for our students. We recognise that learning happens in and outside the classroom and, often, beyond the school gates. We value the talents and experiences that students bring to school and we aim to connect learning to the real world, communicating with real audiences, responding to real briefs, managing real projects and sharing our learning with the rest of the world online, whenever possible. Here are a few examples of ways in which we've attempted to design a creative curriculum. We are experimenting with a new curriculum for students in Years 7, 8 and 9. Instead of discrete ICT lessons, these students will experience one hour per week (if possible in 2 hour blocks) of learning activities designed specifically to develop their ability to think creatively. We are committed to using new technologies for learning, developing personal learning and thinking skills and preparing our young people for life in the 21st century. We are also looking forward to sharing the responsibility for the direction of learning activities with the students themselves. We are really excited by the potential of the Futurelab Enquiring Minds model and we are currently in the process of developing an approach to the curriculum that puts the focus on students' own interests and talents. Check out the website for more details. Check out the Tallis Lab blog. Each class now has its own blog, a place to share ideas, post messages, collaborate with others, share frustrations and celebrate successes. The blogs are not meant to be showcases of best work. Rather, they are intended to reveal the messy and exciting business of learning when we're charting new territory. We are committed to being an outward facing school, one which encourages all out students to become global citizens. Having achieved the intermediate level International Schools Award we are currently applying for advanced status. We also belong to the UNESCO association and the Rep London and Get Set networks of schools actively promoting the Olympic and Paralympic values linked to the 2012 Games in London. We have represented the Creative Partnerships network of UK schools at the Creativity World Forum in Oklahoma (Nov 2010) and we belong to the Space2Cre8 international network sponsored by the University of California at Berkeley. A focus of our cross-curricular learning days has been international engagement, specifically the recent Tallis Perspectives event. Check out the Tallis INternational website for more details. Tallis TV began life when staff and students from Ravensbourne College of Art & Design visited school to run a masterclass on TV production techniques. It is now a fully fledged online broadcasting unit. Students form the editorial committee, shoot all the footage, write the scripts, present links and edit the programmes. They get a bit of help with subtitling and uploading to the internet from staff in the Film & Media department. The schedule of fortnightly episodes, working under pressure and the need for intelligent collaboration means that the students benefit from a deep and engaging learning experience. You can now subscribe to Tallis TV via iTunes. Thomas Tallis is the lead partner in this project. Our other partners are Charlton School, Kidbrooke Park Primary School and the Wide Horizons Outdoor Education Trust. Check out the Learning Away Partnership website for more information. Learning Away is a special Initiative funded by the Paul Hamlyn Foundation that aims to support schools in significantly enhancing young people's learning, achievement and well-being by using innovative residential experiences as an integral part of the curriculum. This programme is focused on the development of Social and Emotional Aspects of Learning (SEAL) and to support all students in coming to a better understanding of themselves as learners - both individually and as part of a group. As such the programme supports the personalisation of learning in meeting the needs and interests of students. Students given the chance to undertake a range of individual and team challenges, and have to use a variety of social and emotional resources to solve problems and work creatively. 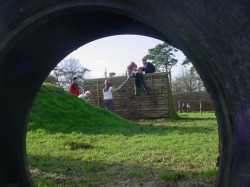 The programme has also involved staff INSET with over 400 staff across the partnership have exposure to training and development in the development of SEAL in outdoor experiences. More information about the programme can ve accessed in the Leading Edge section of the main school website.